John B Yeats’ father was “tall, red headed, scholarly and disapproved of Presbyterians”. When Macauley’s Histories were published he took to his bed and left the parish in his curate’s hands until he had read them all. 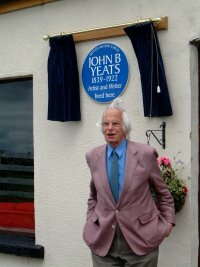 This according to John B’s grandson, Michael Yeats, at the ceremony to unveil a blue plaque in John B’s memory. An overcast but sultry day on a hilltop in County Down was the occasion to mark the birthplace of a remarkable and talented man, the father of two great literary and artistic figures, William and Jack Yeats. 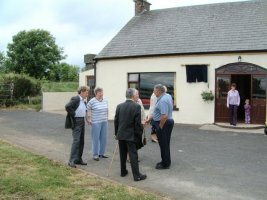 Present for the event were Michael and Grainne Yeats, the Chairperson of the District Council, members and friends of the Kerr family, current owners of the property, and the Ulster History Circle. Mrs Doreen Corcoran, Chairperson of the Ulster History Circle, welcomed the guests, including Mrs Cassie McDermott, Chair of the Banbridge District Council. 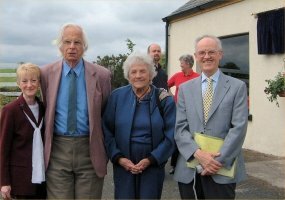 She thanked the Kerr family for agreeing to the erection of the plaque and the District Council for the financial assistance that made it possible. 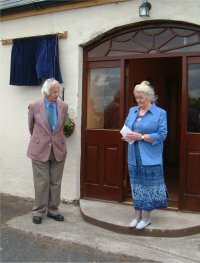 She was pleased that Michael Yeats and his wife Grainne had agreed to attend the event and that Michael would unveil the plaque. 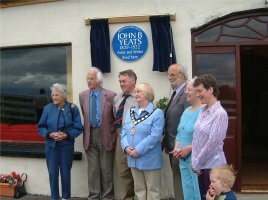 Michael Yeats said how pleased he was to have been invited to unveil the plaque to his grandfather who had been born 165 years ago and spent the last 15 years of his life in New York. He had retained all his life the easy-going attitude of his father. He had spent 12 happy years in Tullylish. He had a profession as Barrister but had given it all up to the detriment of his family as he had no commercial sense. His approach to portraiture was idiosyncratic – if he wasn’t interested in a sitter he wouldn’t finish the painting and if he was was he would spend so much time in discussions that the painting was often not completed either. He once delivered a delayed painting of a wife two years after she died and on the day that a new marriage was being solemnised! The group adjourned to the District Council Offices in Banbridge where the Council had provided refreshments. Victor Price, a member of the Ulster History Circle and a student of the Yeats legacy gave a short, interesting and most enjoyable discourse on the Yeats family and how WB’s poetry had inspired him and provided him, as a young man, with insight and understanding of some of life’s contradictions. 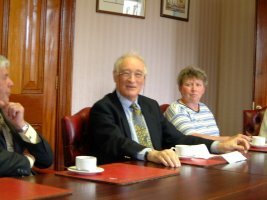 The informal discussions provided many interesting and amusing anecdotes of John B’s approach to art and commerce and it was with regret that we parted company with Michael and Grainne at the end of a happy and delightful occasion.